XI'AN – Some 10,000 Chinese from all over the world gathered on the traditional Tomb-Sweeping Day Saturday morning in front of the Mausoleum of the Huangdi, or the Yellow Emperor, to show their respects to him who is considered in Chinese mythology to be the ancestor of all Chinese. The Tomb-Sweeping Day, also known as Qingming Festival, is a traditional Chinese holiday on which people visit graves of their ancestors. And on this day every year, a grand ceremony is held at the Yellow Emperor's Mausoleum located on Qiaoshan Mountain in Huangling county, northwest China's Shaanxi province. 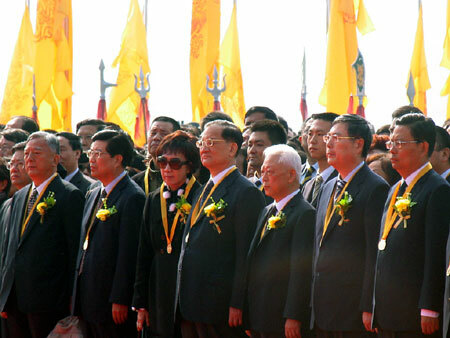 On this year's holiday, honorary chairman of Kuomintang (KMT) Lien Chan led a 35-member delegation from Chinese Taiwan to the ceremony and became the highest-ranking KMT official to the event in the past 60 years. Lien arrived in Xi'an, capital of Shaanxi province, Thursday evening on the third visit to the city. The 73-year-old Lien was born in the city and his grandmother was buried there. Yuan Chunqing, governor of Shaanxi province, said realizing the reunification of the motherland would be the best way to remember the Yellow Emperor. On behalf of survivors of a 8.0-magnitude earthquake on May 12, 2008, six pupils from hard-hit provinces of Sichuan, Shaanxi and Gansu read a poem of blessing at the ceremony. The emperor, a great tribal chief of China's prehistory, is recognized as the first sovereign of China in its civilized history. The invention of, among others, carts, boats, bows and arrows, and the traditional Chinese medicine are attributed to him. One of his imperial historians is believed to have created Chinese pictography. These landmark achievements were indispensable to the later success of China as one of the world's four great ancient civilizations.